The menu gives project managers and architects a general understanding of the types of problems simulation can help solve and when it should be implemented. This framework gives energy modelers a starting point from which to craft their analysis process and consider questions that weren't originally on their radar. As we receive more crowd-sourced content, we'll link more and more case studies and graphic outputs to each question. We'll also add any new questions that weren't included in this original framework. How often can I open a window in this climate? Where do the winds predominantly come from? On an annual basis? By season? By day vs. night? 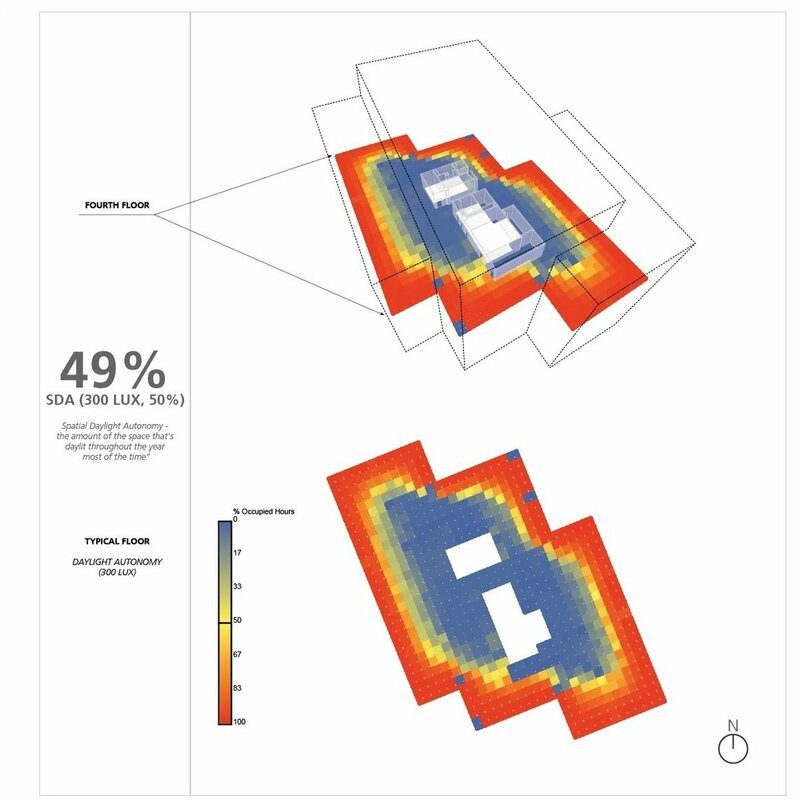 Should I design my daylighting strategy based on a cloudy or sunny climate? What directions produce the most solar gain? What are the optimal orientation for solar panels, both in terms of azimuth and altitude? How daylit is my building annually? I.E. How often can lights be dimmed/off with Daylighting? How many/how large should skylights be for adequate Daylighting? What is optimum Window/Wall Ratio for Daylighting? What is the impact on daylighting between automated and manual blinds? How can the building's architecture be designed to help encourage more active occupants around interior blinds management, thus improving overall daylighting levels? For interior window treatments, do blinds or shades perform better? What is the reduction in annual daylight based on external shading systems? When will occupants experience glare from daylight throughout the year? How often are blinds deployed in my building to combat glare? If interior surface reflectances are brighter, how does this affect visual comfort? How does a light shelf impact the distribution of daylight and glare in a space? Which Massing/Orientation options are preferable for Solar Gain? How much solar gain is beneficial? What is the optimum SHGC for energy use? How much can I downsize cooling system with a lower SHGC? How much do different window shading designs reduce solar insolation during the peak hour, day, season, or month? How much does each envelope component contribute to Peak Loads? What are the right performance properties for the windows? How much can I downsize my mechanical system by installing more insulation? What is the right amount of insulation in the walls? What are the peak loads and rough mechanical cost? How much money can I save by reducing mechanical system size through load reduction measures? When are the peak loads occurring and how do I reduce them? Which zones are driving my peak cooling and peak heating load? Do my perimeter zones meet my cooling load capacity target for high performance systems like chilled beams, radiant systems, or natural ventilation? What is energy used for on an annual/monthly/daily basis? How much fan energy does natural ventilation save? How much cooling energy does natural ventilation save? What level of comfort can I expect inside my naturally ventilated building? What sizes/quantities of operable windows are needed for natural ventilation? What are the optimal night flush schedules and control settings that optimize energy savings? Will my building be able to maintain comfortable indoor temperatures without power? For how long? How will the building perform without energy inputs? What are my energy end uses ranked from highest to lowest? What is the approximate EUI of my building? How close am I to hitting my % better than code or reference building energy target? How much more energy will my building use if the occupant density or use schedules vary from initial assumptions? How sensitive is my building to different window to wall area ratios? How much electric lighting energy will be saved by Daylighting? What is the optimal shape of shading systems that optimizes whole building performance, i.e. provide a net benefit between heating, cooling, and lighting energy while still reducing HVAC system size? Is my building/space type a good candidate for demand control ventilation? How much energy would it save? Is my building a good candidate for energy recovery ventilation? How much energy does it save?